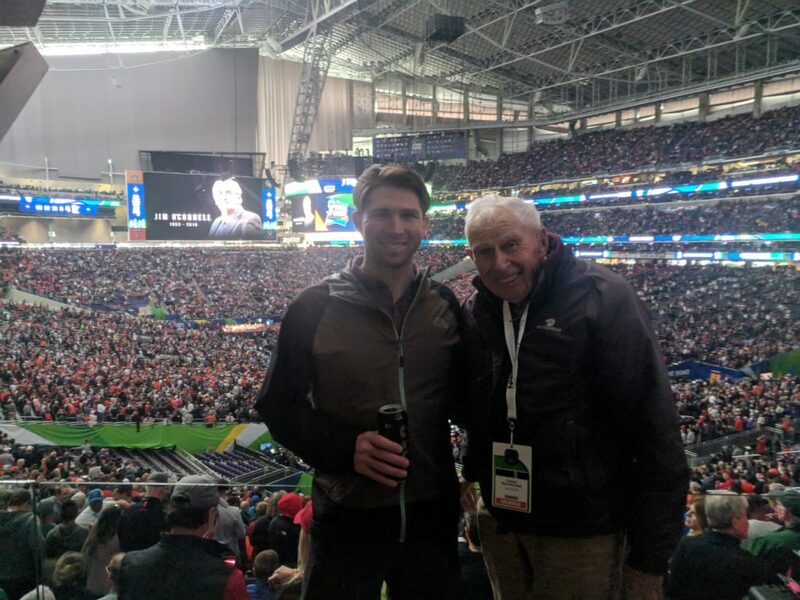 4/16/19 – Last week I was in Minneapolis to attend the NCAA Final Four with my mom and Grandpa. My 93 year old grandfather has been attending the Final Four for 50 years. He was a high school administrator and coach in Montana for many years. My mom has been attending Final Fours with him for the past 25 years. With the event being held just down the road this year it was a good opportunity to join them. Me and my grandpa Dan at the Final Four in Minneapolis. While in Minneapolis, I had the great fortune of getting together with Sawbill Alum, Pat Nash, who I worked with in 2009. 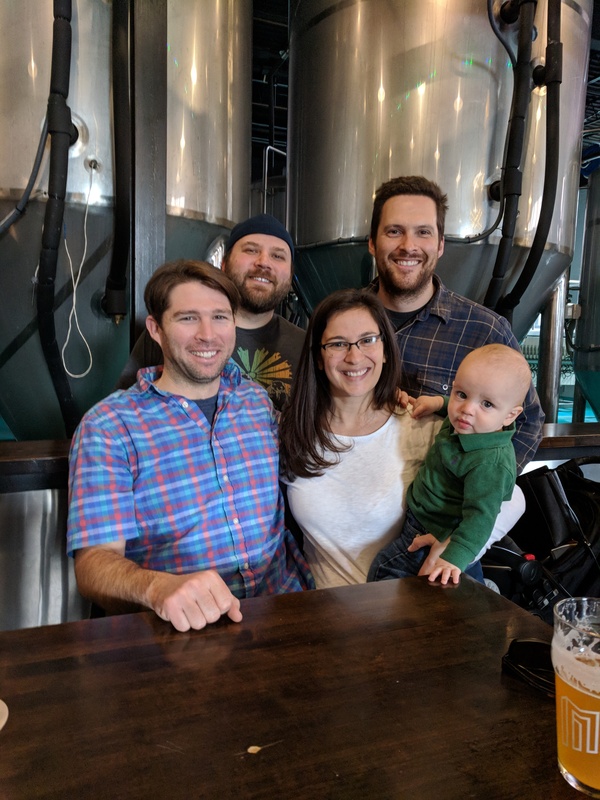 Also joining in the improptu reunion were my brother in law Adam Hansen, of considerable Sawbill fame, and Lisa Burtch and their almost-one-year-old son Louis. Good times! 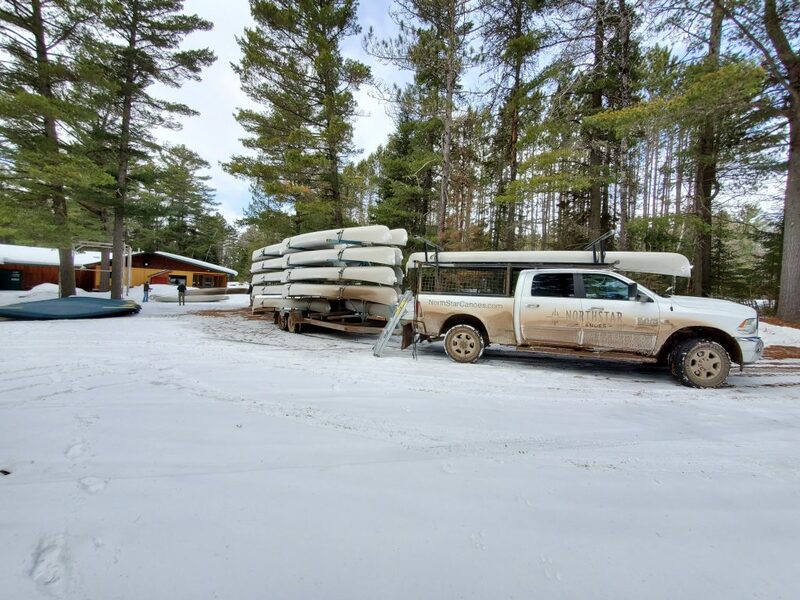 4/12/2019 – In order to keep our fleet of rental canoes new and in great condition, we regularly sell off our used stock. It has been a long standing Sawbill tradition to pass along our canoes in as good of condition as we can. We strive for them to have the most functionality, longest (after) life and beauty that we can. 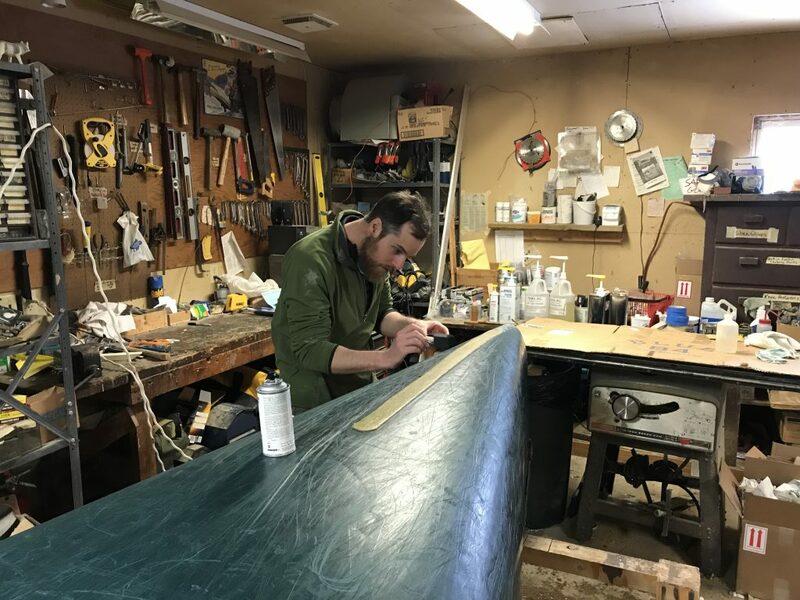 To that end, each time a canoe is rented we provide a comprehensive tutorial to our customers on canoe-care best practices while paddling the wilderness. We also complete timely and professional repairs as needed. We think these canoes are a great value and will provide many years of paddling joy…. and no stress about getting the first scratch. See current availability here. Kevlar is a composite material manufactured as a woven fabric. It is lightweight and very durable. 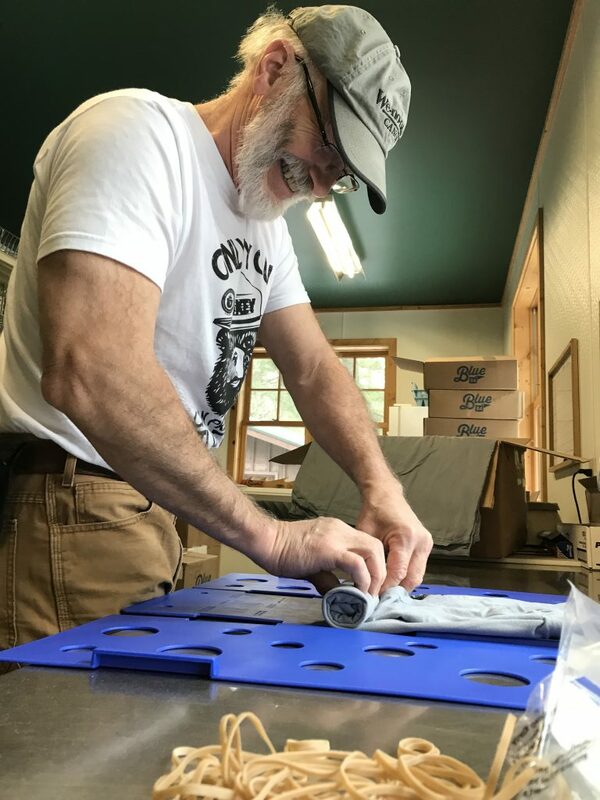 Using vinyl ester or epoxy resins, layers of kevlar are laminated together inside of the boat mold and hooked up to a vacuum bag system to evenly distribute the resin and remove any excess. This allows the canoes to be constructed using the minimal amount of materials necessary to achieve ultra lightweight and structural integrity. 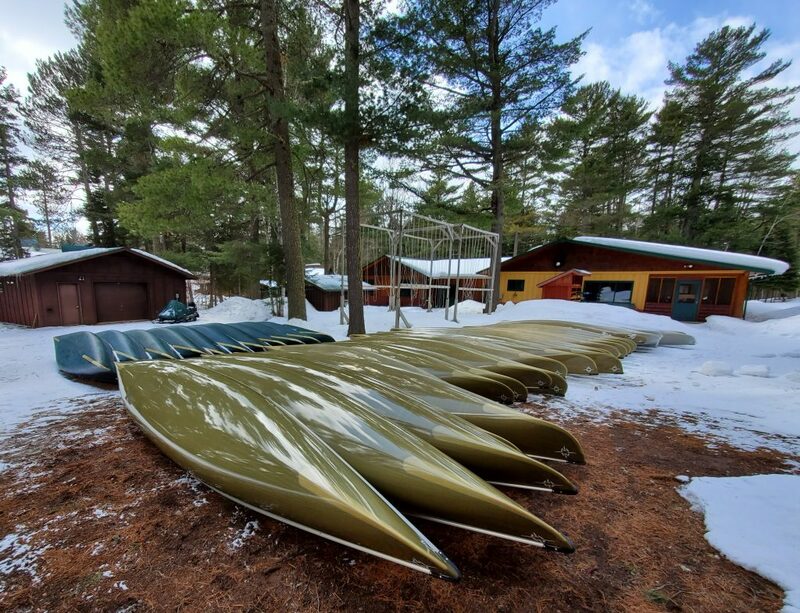 We rent most of our kevlar canoes for three seasons before selling them. A few are kept for a fourth season if they end up getting stuck on the bottom of the stack and don’t get used as much – or if it’s a less popular model. Prior to sale, we install new external kevlar skid plates to the bow and stern. These skid plates are custom formed to match the lines of the boat in order to provide protection in the high wear spots without excess material. Refurbished skid plates that match the lines of the canoe. A fresh coat of resin is applied to the bottom of the canoe. This resin layer fills in all of the scratches and results in a smooth shiny finish. The areas above the fresh resin are finished with a layer of marine varnish to provide UV protection. Any other necessary repairs are also completed to return the canoe to full functionality. Any deviation from this procedure will be noted on the sale listing. Fresh resin applied to the bottom of the canoe. Canoes are priced based on age and condition. Price is typically reduced for older canoes and for any patches that may have been applied. Royalex was a long standing go-to canoe construction material. It is durable, relatively light and paddles well in both rivers and lakes. The ABS plastic material was discontinued a few years ago, leaving a gap in the canoe market. After a few years of R&D, Equif Canoes developed a new ABS plastic laminate they have dubbed T-Formex. 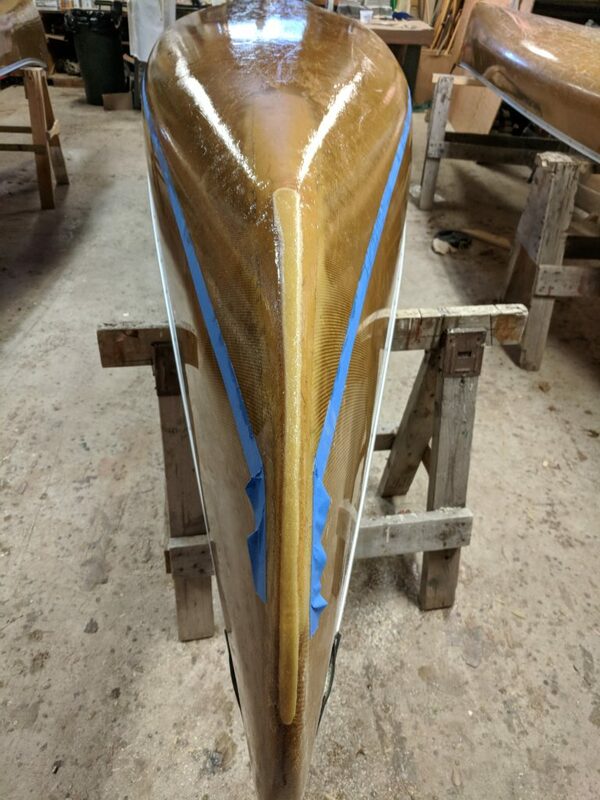 Sawbill will carry a handful of T-Formex constructed canoes, made by Wenonah in the 2019 season. Due to the great durability of the these materials, we keep boats constructed of Royalex/T-Formex for a few years longer before selling them. Like their kevlar counterparts, we install external kevlar skid plates. We also touch up any scuffed paint and treat with 303 Protectant. 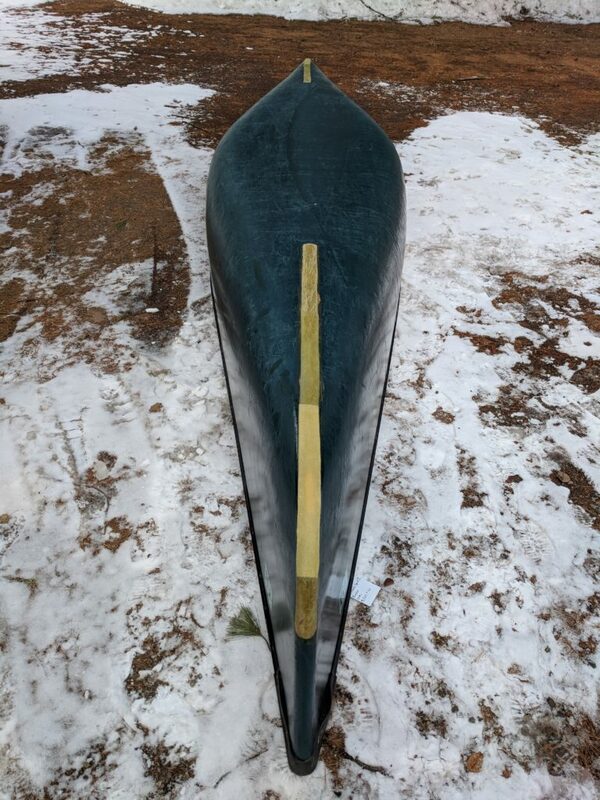 Refurbished Royalex canoe with repaired skid plates. 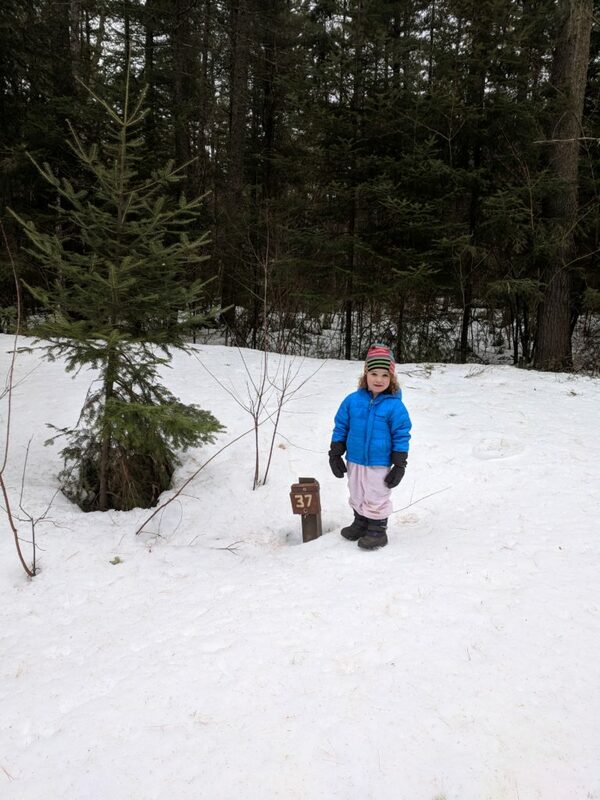 Our walk began outside the screen porch where the hefty load of snow recently slid off. 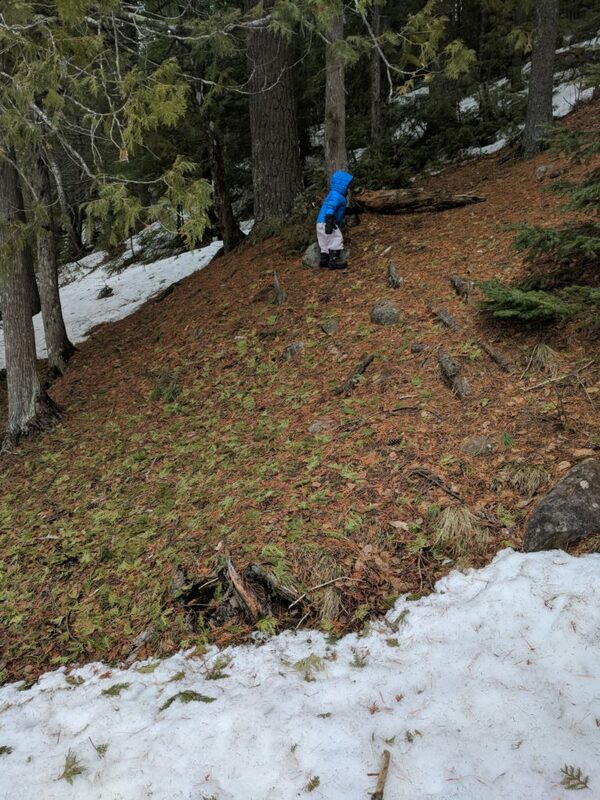 The snow has finally melted off of the Sawbill Trail, but the high banks continue to block access to the lake and the campground. Kit at the entrance to campsite 37 – that sign is about 3 feet tall. 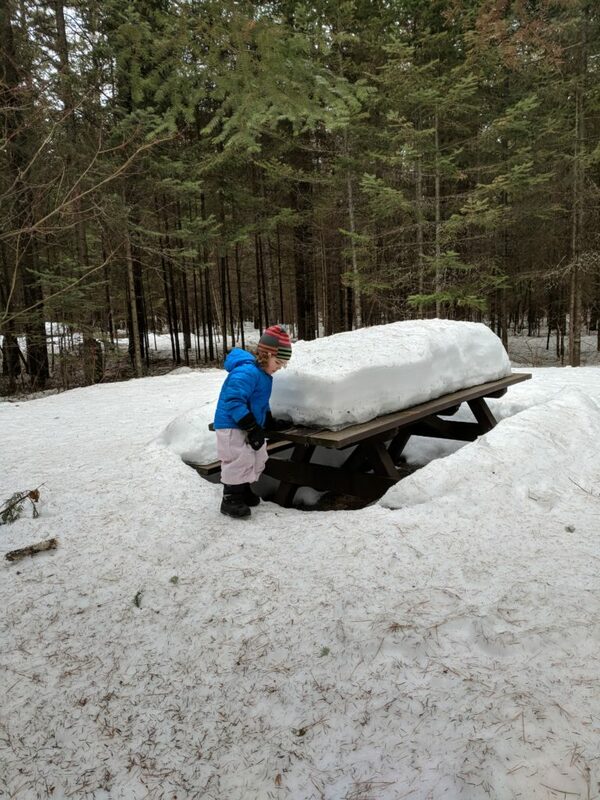 Picnic tables not quite ready yet. Patches of bare ground showing in the ditches. Stairs leading from campground down to the lake path. Large patch of ground in a cedar grove along the lake path. The lake is still firmly locked up with over 2 feet of ice. On this day it was frozen smooth and slick with patches of drifting snow. It prompted me to go for an ice skate (unfortunately no photos of skating). A soggy Sunday afternoon on Sawbill lake. 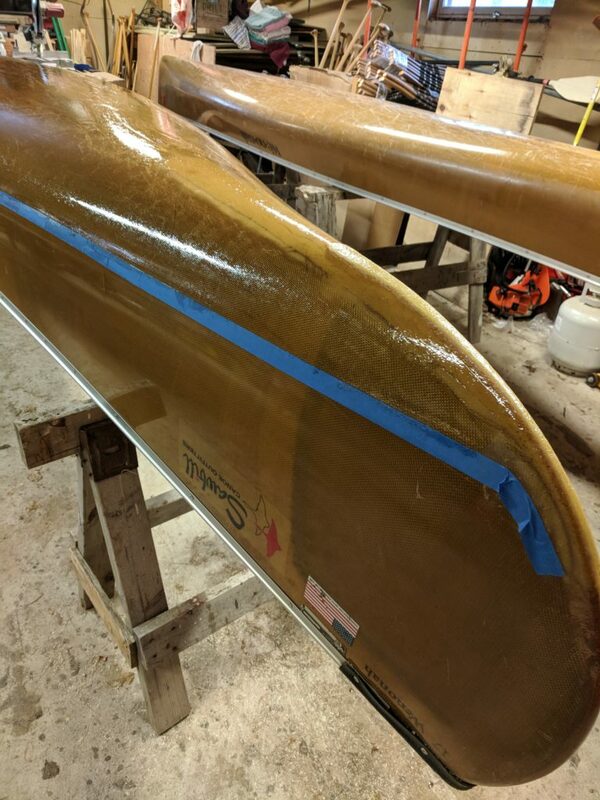 Paul touching up the exterior of a Royalex canoe before refurbishing the Kevlar skid plate and treating with 303 marine protectant. 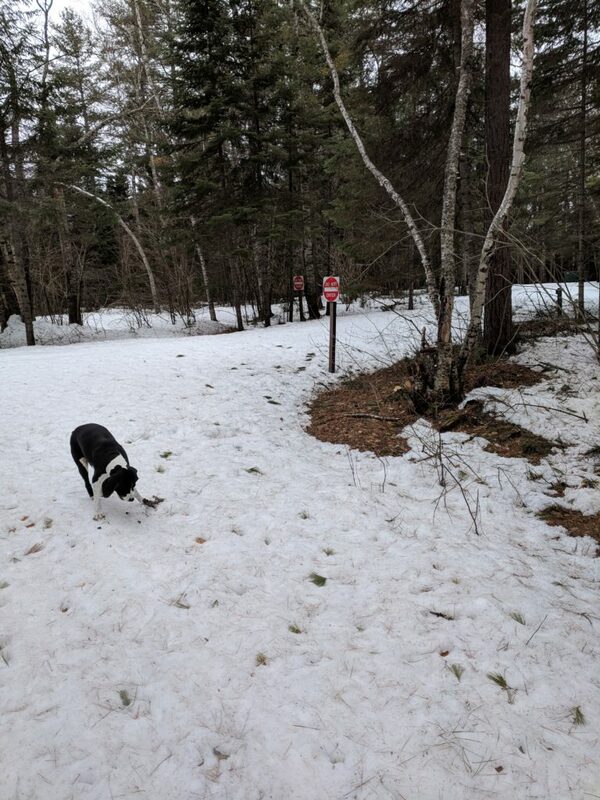 3/30/19 – It’s finally starting to feel a little like spring around here, which prompted me to drill the first test hole of the season yesterday evening. 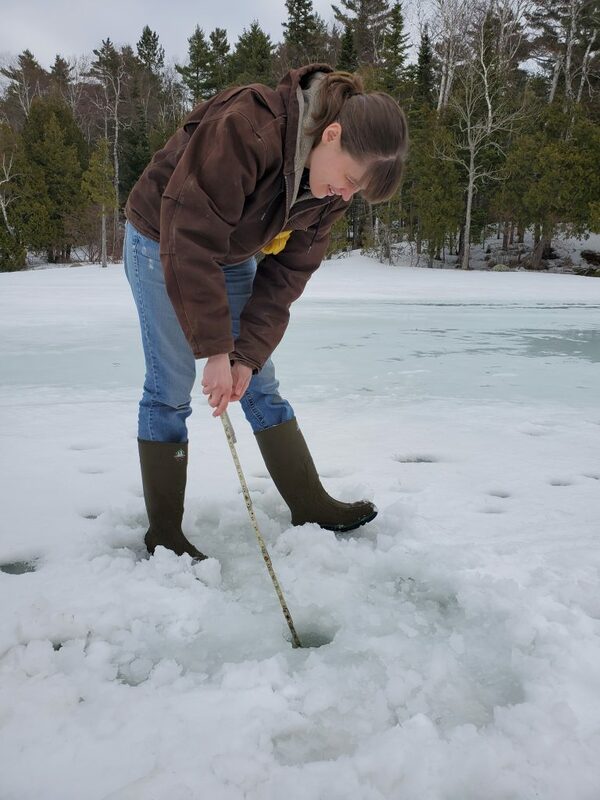 The lake is currently sporting 27″ of ice depth. 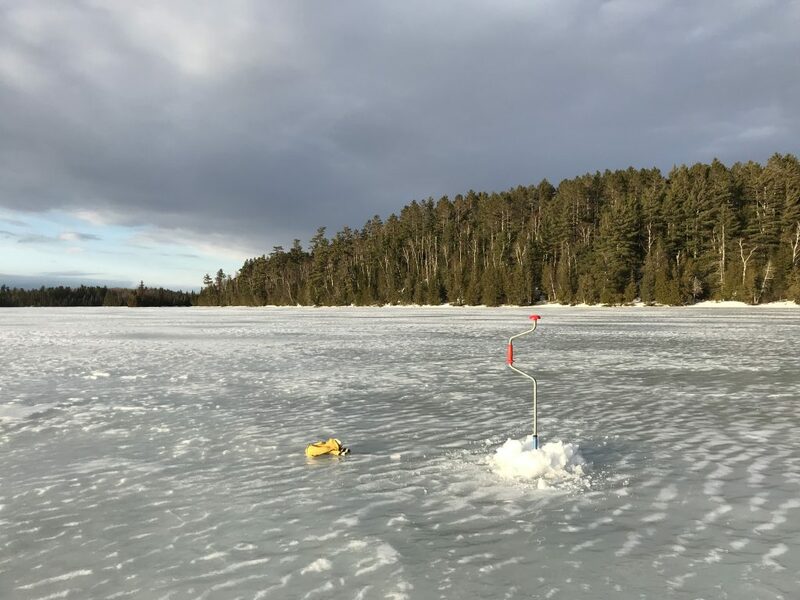 There is hope however, as all 27″ didn’t seem to be solid ice, well most of it was, but there were two 1-2″ pockets of water separating three solid layers of ice. 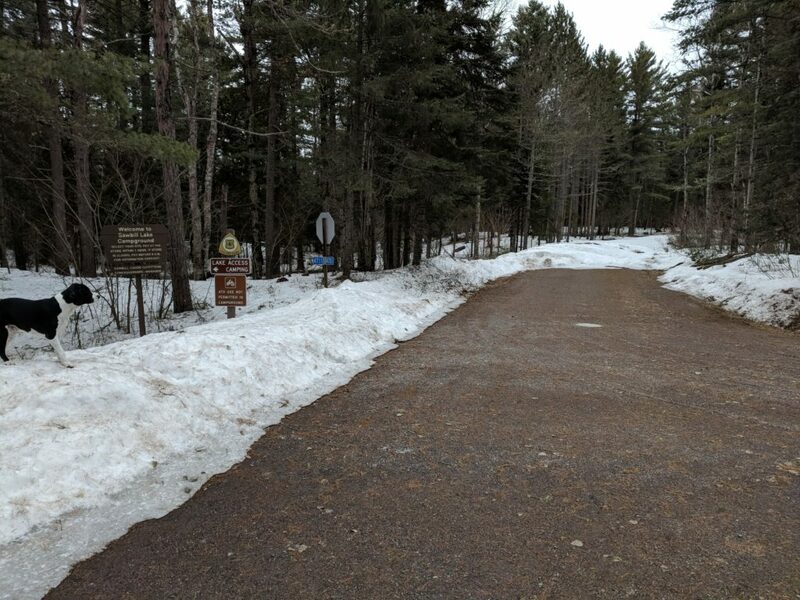 3/3/19 – On the eve of the second attempt at launching the updated recreation.gov website for Boundary Waters Canoe Area Wilderness overnight permits, we wanted to summarize the changes and let you know what information you’ll need in order to complete your permit reservation. The Forest Service has christened this event as “Go-Live”. 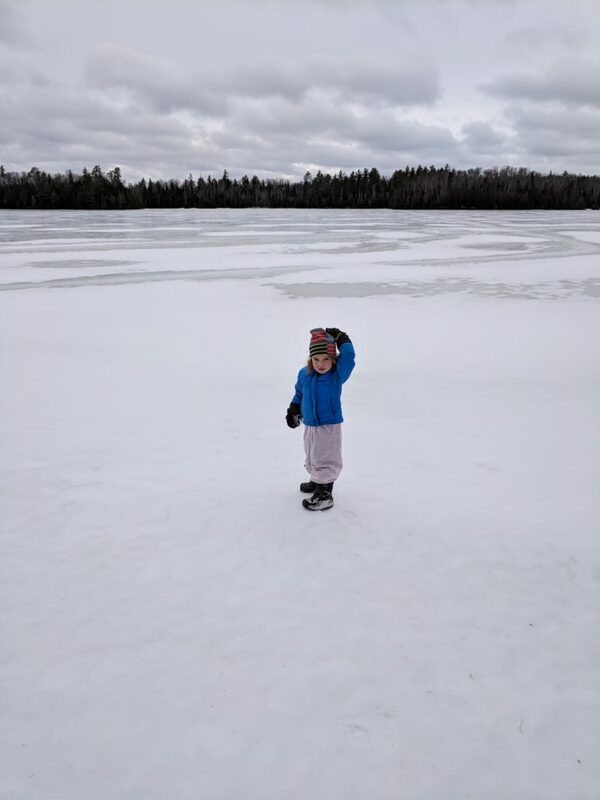 Where: The BWCA subsection of recreation.gov. Follow this link to take you directly to the spot. Otherwise, from the recreation.gov homepage, simply search Boundary Waters Canoe Area Wilderness Permits. Alternate Leader name(s) – up to 4 alternate leaders can be designated at the time of reservation. Alternate Leaders are entitled to possess the Permit in the event the Group Leader cannot attend the trip. Alternate Leaders may not be added after the time of reservation. Group Member names (optional at time of reservation) – new this year, all members of the group are going to be listed on the permit. These names, can be added/deleted/changed up until the time of permit issuance. If not known at time of reservation, they may be added later. Watercraft information (optional at time of reservation) – the type and number of watercraft must be designated. This can be changed up until time of permit issuance. For example, 2 canoes. Credit Card to pay use fee and reservation fee. Senior/Access pass number – if you are a card holder, the number must be entered at the time of reservation and the card must be presented at the time of permit issuance. Permit Issuing Station – you’ll need to select where you’d like to pick up your permit. 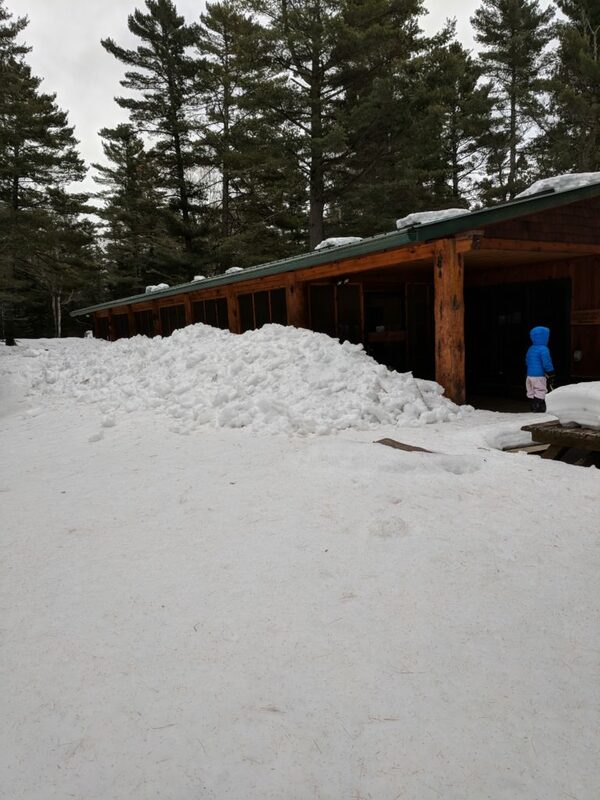 The default will be the nearest Ranger Station to the entry point, but you may select a cooperating business, such as Sawbill Canoe Outfitters. There is no extra cost, and the permit will be at the Cooperator (Sawbill) eliminating a stop at the Ranger Station. 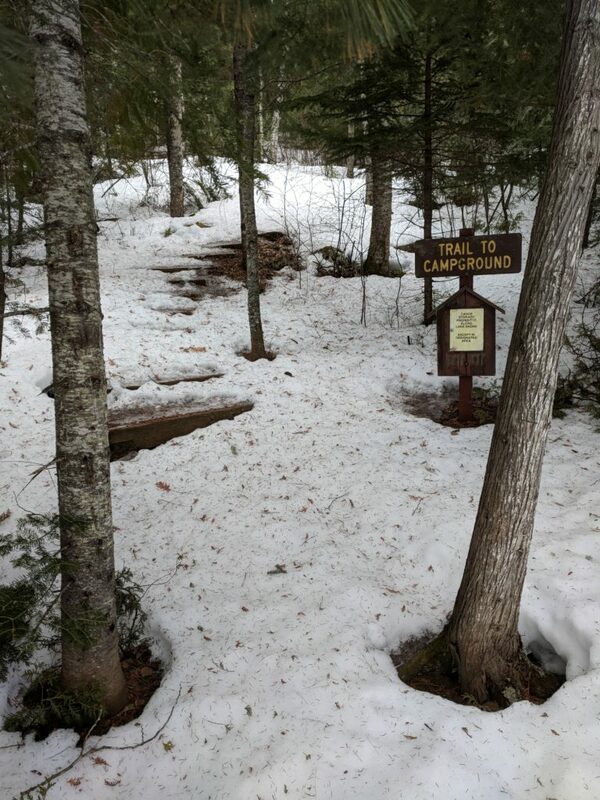 What: You will need a permit for all overnight camping inside the BWCA Wilderness. (Day trips that don’t include an overnight stay only require a free, self issued, day use permit available at the entry point). Each entry point has a different daily quota. The permit does not reserve camping at any given location, it simply entitles entry from a specific starting point on a specific date. Once inside the Wilderness, groups can go wherever they please and camp at any available designated campsite. A group can stay in the Wilderness for any continuous amount of time. A group is limited to a maximum of 9 people and 4 watercraft. Most of this information is the same as the previous system and the user interface is largely the same, too. Be sure to use an email address that you actively monitor as you will be sent a series of informational videos required to be viewed prior to your arrival. As always, let us know if you have any questions or need our assistance! Best of luck!